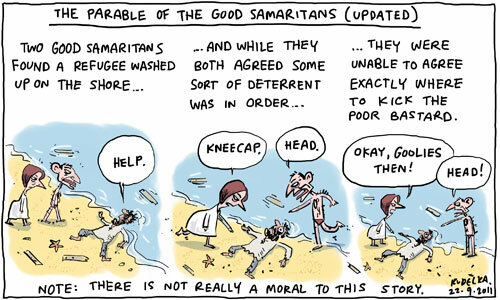 Posted in political cartoons, The Australian and tagged boat people, refugees, abbott, Gillard, asylum seekers, samaritan. When will we find a leader who chooses to follow the wishes of the Australian people? When will a leader pour scorn on their “backroom pollsters” who believe that Western Sydney is all of Australia? When will decency and compassion again have a place in Australian politics? When will they ever learn? When will they ever learn!